I'm really so touched by CA Conrad's attention to Occultations, by how hard he worked in concert with Rob Halpern, Brenda Iijima, J. Townsend, Thom Donovan, and Jules Boykoff, to put together the interview, the featured poetry, and, of course, the community commentary. All the mini-reviews were touching, deeply so, each so insightful if a little too kind. I do want to draw your attention to Rob's review for a very specific reason: in the midst of a move (tenure track job!) to Michigan, Rob wrote a really in-depth piece, one that were he interested in credit, could have been published in a journal someplace, so thorough and investigatory it is. I want to thank him for this. He emailed me a pdf of it a couple days before it came out, and of course I didn't get back to him in any timely way whatsoever (my M.O for emailing). So I don't think Rob's piece gets the props it deserves for sheer amount of time he took to ponder the work, write it. Rob doesn't do things half-assed, which I admire. His compulsions end up making others happy. I hope Conrad doesn't mind, but here's Rob's review, which were it a review in the sense of "hey read this great book," I wouldn't post here. But as per Rob's work overall, the review is rather an essay thinking through issues both of us, and I take many of you, are interested in. Many thanks to all for the feature! That I post Rob's writeup here is no reflection on how good/touching each of the pieces are. Link to the entire feature is on the right side of the blog here, under Book Info & Reviews. It was David’s affect that attracted me first — open, vulnerable, patient, disarming — all the qualities a queer boy like myself longs for in other guys, whether there’s some amorous prospect to be realized or not. This was several years ago, but the impression remains fresh. David and I introduced ourselves to one another in a dining commons at Bard College. We both had summer gigs teaching in the Language and Thinking program, a scene of deep collaboration around poetry and pedagogy, which would become the setting for our new friendship. There is a critical militancy that complements David’s affect — permeates it — augmenting, rather than contradicting, all his qualities that move me. Within a few minutes of our meeting, we got to talking about student activism at the Evergreen State College, where I had spent some time as an undergraduate, and where David currently teaches. We found common ground discussing campus politics — always a distorted mirror of larger social forces — and how our various political engagements, both there and elsewhere, changed our lives. David’s militancy moves from the union to the classroom, from the clinic to the street, through institutional zones and practices where our collective well-being — the commons — is always being stimulated and suppressed, aroused and seized. I don’t use the term “militant” casually or commonly, but I like the idea of linking it to the commons. Against the grain of dominant “common sense” — grotesque ideology — militating and communing are not at odds. The militant body may even be consonant with the common body, at home in it — the body as commons? Habeas corpus — to have the body — becomes our common ground, if only because of the hostile social processes that disable, subject, constrain, and debase all our bodies commonly. And yet the body also potentiates a resource in excess of anything we can currently name. In his introduction to the recently translated Genocide in the Neighborhood, a work that emerged from Argentine activist groups responding to the situation of the disappeared, Brian Whitener notes “ ‘militant’ doesn’t mean military […] militant signifies a stronger commitment to politicized collectivity”, and this may get at the sum of David’s practices, pedagogically and poetically. Whether in a classroom or a waiting room, a poem or a chant, a community of friends or a union of laborers, David’s writing and person activate this commitment to collective engagement, while militating for an enlarged politics. At a recent Nonsite Collective event where David facilitated a discussion on “The Commons and the Body”, I quickly cribbed a few notes to help me introduce his poetry to the group. I wrote: “In David’s writing, the body becomes an occlusion in common sense.” The phrase came unexpectedly. What was I getting at? : the body as resistant to any regime of knowledge — be it medical or military — that would make of it a ward. The body manifests in David’s poems not as an object, but as a situation where too many social processes, institutions, and apparatuses converge — medical, military, labor, financial, environmental — in often hostile ways, despite whatever benign appearance. David’s body is a body in revolt from the object status to which these apparatuses subject it, and his poetry is nothing if not an agitator in the interest of this revolt. This is “the body-as-a-hole” (Occultations 77). This is the body struggling to affect a radical displacement in orders of common sense that determine what can and can’t be seen and said. This is the body as supplement and void — in excess of what counts and thus not legitimately here — challenging everything that serves to enforce orders of state. This is the body as nonsite of the commons, the commons being what is not here, the only thing we can share in truth, a set of social relations we’ve failed to actualize, a blank of pure potential, where we’re always dying, and always becoming. This is the body as an assemblage of intensities linked to multiple scenes of power that contain all our utopian and dystopian possibilities: all the vicissitudes of care and harm. This is the body as the critical situation of our undoing: the body as a commons in the way failure is a possibility we don’t know what to do with. Tortured body. War torn body. Environmentally ill body. Ecstatic body. Immolated body. “What work this dying is,” he writes. David’s poems consistently make the occulted links between various scenes of the body’s expropriation perceptible. And while the poems affirm not knowing what a body can do, they nonetheless register what the body can’t do insofar as its flows have been obstructed, expropriated, owned, and forced to persist in irresolvable conflict with militarized production, environmental degradation, and geopolitical debasement. David’s writing portends the body as a kind of “dissipative structure” — (according to chaos theory, a form of organization that resists its own conditions of dissipating energy and eroding resource) — a body at once vulnerable and resistant to every form of social erosion, a vulnerability and a resistance commensurate with the struggle to organize under conditions where the commons and the body alike go on sliding entropically toward exhausted resource. Organize what? : a community, a union, a classroom, a collective, a poem: “organization” being a dynamic movement between all these organs. Prosody as organized pulse. Under these conditions of ongoing war and environmental disaster, what has been occulted — nonsite: withdrawn from view — is as much the war-torn body, or the flood victim body, or the fallen militant body, as the memoranda that make these bodies possible, all of which are inseparable from the sick body here,wherever we might call home. David’s writing proposes to resurrect the failed body as potential and resource. And in this sense, too, his work proposes a perverse model of our occluded commons — body-as-a-hole — the body that fails to count within dominant regimes of visibility. This is the body as “collateral damage”, and it shares what can’t be shared with the militant body fallen in the streets of Gaza, and with the transgendered body violated here on Mission Street. Just as the commons may be thought of as a nonsite whose history is the story of its own expropriation, this body is a disappearing act: negative ontology of our only common resource. This is the commons as the blank in history — history of the future that haunts us now — and David’s poems propose “degraded lyric as convergence of [these] aporias / The strange tremor of unusual poverties / Of not knowing what will come of this” (Occultations 117). The militant body — the body as secret agent of our commons — hangs on that not, the withdrawn secret of a counter-capacity waiting to be activated, waiting to surge. This may be our occultation: the militant body as site of common refusal, zone of uncharted futures. This is also the body whose patiency suspends all property relations, to one another and to our life processes — “giving oneself over as shared resource” “given over to community” (David’s notes) — rendering the corpus open, disarming, and vulnerable to forms of unanticipated care, while resisting any form of knowledge that would further subject it. Here is the abundance of the patient body — “a capacity without limit” — whose unruly excess persists in revolt against a grammar of proper agents and objects, a system that disables, limits, constrains. David’s writing is the militant affirmation of this patiency. I've been meaning to publish follow-up notes regarding my trip to the Bay for reading, Nonsite Collective talk/workshop, and other things--a triad of posts, and so far I've only gotten to one, on the wonderful evening I had reading with Rob Halpern for David Brazil & Sara Larsen's reading series. Notes on the Nonsite event are to be published on the Nonsite website. Crucial follow-ups, especially now that Halpern, Thom Donovan and Stephen Collis just did their panel discussion on the commons up in Vancouver as part of the KSW series. All talks relating to reclamation of public space, re-envisioning the commons and commoning. Teaching has been the primary culprit in not sitting down to flesh out what paltry illegible notes I have. But one thing I did ask of those in attendance was to, at some point, perform a poetic intervention in the form of somatic practice (specifically concentrating on "giving up a sense of propriety to your body") in the workplace. Notes to come, but Amber DiPietra beat me to the punch in humbling ways. 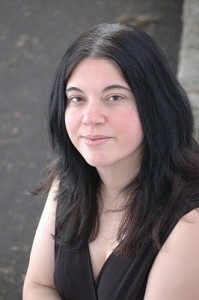 DiPietra, besides being a wildly talented poet, works as a social worker and advocate for "the disabled," which, as she has noted in her crucial paper on a new poetics of disability (available as pdf at Nonsite's website), often comes into perceived conflict with her other work, poetry and poetics. The conflict between trying to place "disabled" people into fixed employment, while as poet and participant in Nonsite, working to undermine normative ascriptions of "disability" in daily life and (same thing) in poetics, where on the one hand poetics of disability over the past several years has emphasized ableism, or on the other, has tried to reposition terms via deconstructing them: making the obvious point that "disability" assumes--is parasitic on--"ability," an assumption that is variously challenged. DiPietra is among the folks uniquely situated to realize the pitfalls and problematics of both sets of theses. And she performs that struggle, making public her oscillation between worlds, the unresolve-able tensions here between the Now (as people who are specially tuned to recognize and be subjugated by the hostile physical environment of the marketplace) and what could be/should be, commoning practices that recognize and communally accommodate in-essential differences, which, of course, are just as easily described as particularized capacities. After reading this post by Amber, though I obviously don't have any deep understanding of her day to day work, nor do I think these tensions are somehow overplayed her, I still get the sense that DiPietra (along with amazing Nonsite dancer-coreographer-poet Petra Kuppers), due to their very particular work, enact a kind of body-commons intervention at and as their different workplaces. Amber the poet uniquely informs her position as Amber the social worker. Where I'd imagine the two sometimes, tho for DiPietra perhaps not enough, fuse into one. Nonetheless, and in a larger societal sense, these tensions play out; and do so in DiPietra's recent blog entry describing--and beautifully displaying--her workplace somatic. And yes, I say to her opening with acknowledging that every day for her is a somatic practice--yes, that resonates with me deeply. In writing Occultations that was one thing I wanted to enact in non-normative languages and page construction. And also thru performativity. So I was just now alerted to this writeup, despite it being posted over a month ago--I am so unhelpfully Cartesian sometimes! Thanks for this, Amber. As usual the insights here, along with the tensions, are palpably lasting and visceral. Well, I guess I've finally begun collating my notes on the Nonsite talk! Thanks for that too, Amber. Need now is a news form of life. In the killing fields of Orlando. I will work on developing ptosis. Fold traces of me, what do you think of. An extended anything but scandalwas. They took us to Toronto once. This is really shocking news. Woke up this morning to find out that Michael Gizzi had died. I only met Michael once, so what I think I feel about this is empathy for his friends, some of whom are close friends of mine, along with a really sudden realization that Gizzi won't be producing new work for us. Anyway, wanted to steer folks who haven't seen/heard it yet to Gizzi's PennSound page, republished yesterday. Some really amazing recordings, so do check it out. So much thanks to Anne Gorrick and curators of the 20th Annual Subterranean Poetry Festival for inviting me to perform pieces from Occultations there. And many thanks to Sam Truitt, who not only drove me there, but performed the 2nd voice of "modular arterial cacophony." Did so very inventively, if I may say. Many highlights to the event, from Maryrose Larkin's reading from her new book to (my favorite) George Quasha's Axial drumming. Of course, the venue itself, an abandoned mine cave in upstate New York is the highlight. My only regret was not having time to go scout the place ahead of time, and to utilize it as an INCREDIBLE acoustic space. One especially apt combination was the cave and fellow Black Radish Books author Cara Benson, who performed work thusly . By the by, here's Quasha's filming of friend & collaborator (who did the fire ritual in Occultations) Kythe Heller. Rather beautiful. And it gets you to some of Quasha's other work via his channel. Mind you, both Heller and Quasha are really live experiences, are as much spaces/places as people--by that I mean living places to be & become, and so film doesn't quite get at what happens here. Report on Debrah Morkun's fantastic reading plus audio/visual additions--CA Conrad interviewed at Evergreen--up at the PRESS blog. Enjoy. "this fence keeps you in your world"
Allow me to point (en pointe?) 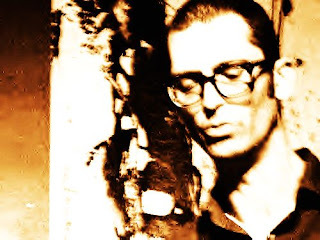 you to Steven Fama's really fantastic writeup slash review of a) the new Dusie, chaps all available as pdfs online, and b) focusing on Mark Lamoureux's beautiful Dance Poems. This is a thorough, brilliant review, with example poems, close reading--so check it out. And as Fama notes, he's right now reading Spectre, Lamoureux's new full-length collection from Black Radish Books, publisher of Occultations. Spectre contains gem after gem. More on that soon. Midnight's Marsupium & The New LRL 5 plus E-Chaps! This week, The Knives Forks and Spoons Press in the UK released Michael Leong's chapbook, called Midnight's Marsupium . Leong's a really fascinating poet who I've posted about before. His work really does a lot of genre breakage, but tho Leong's well versed in contemporary poetics, such breakage never feels like a focal point or "reason" for the work to come out the way it does. Rather, I take it that Leong writes from the standpoint of aesthetic necessity: sometimes the work comes out like this, sometimes it needs come out like that, etc. Which produces a wonderfully kaleidoscopic set of poetic refrains, where Leong mines language for its tucked away secrets, treats the line, the word, the signifier with utmost materiality--and care. Check out the chapbook, poems of which just appeared in the new Wheelhouse Magazine, Issue 9. We are excited to announce the official launch of **Little Red Leaves Issue 5** -- our biggest issue yet with over 30 new poets, extended project features from Carmen Giménez Smith and Robin Tremblay-McGaw, an interview with Brenda Ilijima by Thomas Fink, a gorgeous selection from the Paros Translation Symposium as well as 5 new e-editions. ____Special Feature from the **Paros Translation Symposium** edited and introduced by Joseph Mosconi. With Susan Gevirtz, Angelos Parthenis, Steve Dickison, John Sakkis, Demosthenes Agrafiotis, Eleni Stecopoulos, Katerina Iliopoulou, Liana Sakelliou, Mairi Alexopoulou,Maria Laina, Phoebe Giannisi, Siarita Kouka, Socrates Kabouropoulos, Thanasis Maskaleris,and Vassilis Manoussakis. ____New Work By: Hugo García Manríquez, Stan Apps, Valerie Coulton & Ed Smallfield, Amina Cain, Carolyn Guinzio, Roberto Tejada, Jimmy Lo, Justin Audia, Travis Macdonald, Tasha Marren, Cindy Savett, Kelli Stevens Kane, Aby Kaupang, Carrie Hunter, Amanda Ackerman, Judith Goldman, Jared Shickling, Brad Vogler, Matthew Cooperman, Beverly Dahlen, Karen Hannah, Arkava Das, Christine Kanownik, Laura Wetherington, Burt Kimmelman, Nathalie Knight, William Allegrezza, Meg Barboza, Adam Fagin, and Matt McBride. Sarah Campbell's __Everything We Could Ask For__, Brian Mornar's __Three American Letters__, Mathew Timmons' __Sound Noise__, Gloria Frym's __Any Time Soon__, and Eléna Rivera's __Remembrance of Things Plastic__. With many thanks to all our readers and everyone included!! Martin's book of the same title has been an invaluable resource for organizers. The video below gives you a taste of what is going on during a union busting campaign. Recommended. The late Martin Jay Levitt spent 19 years “on the dark side,” running 250 union-busting campaigns for corporations around the country. He was good at it, too, losing a mere five. In this video, “Confessions of a Union Buster,” Levitt share his experience, trade secrets and tips with Delta Air Lines’ more than 20,000 flight attendants who will begin voting Sept. 29 onforming a union with the Flight Attendants-CWA (AFA-CWA). The video was produced by Delta AFA using excerpts from Levitt’s seminars and book of the same name. Two of the main gospels of any anti-union campaign, says Levitt, are misinformation and fear. A union buster without the atmosphere or climate of fear is like working without one leg and one arm. Fear is essential. Fear is like caviar, lobster and filet mignon to a union buster. Along with breaking the law, the element and emotion of fear is vital. No surprise, but as in past campaigns Delta is running an anti-union drive with fear and misinformation as the focus. Then, says Levitt, comes the divide and conquer strategy. The more we knew about the demographics and individuals, the more we could set them up. We would pit religion against religion, race against race…we would use background information to set people in some vicious ways, plant false rumors, to ruin lives, if you will. But there is one thing, Levitt says, that union busters fear the most: An informed and prepared group of workers who are in a sense “inoculated” against the tactics and schemes in the union buster’s playbook. When inoculation is put in force with employees and they see it come true, it creates a feeling of rage—“How can the company be doing something like that?”—and that rage translates to a solidarity which beat me…the most effective weapon you have to beat the union buster is exposure. The Delta election runs through Nov. 3 and will be conducted under the National Mediation Board’s new democratic election rules that allow a majority of votes cast to decide the outcome. Yesterday, Senate Republicans failed to overturn the new rules. For more information and the latest news on the campaign, visit www.deltaafa.org. Here's a strange pairing. My great-grandparents above. Sharing a moment--a union victory--with Eliot Spitzer, then AG of NY, below. Of the books I've read during my Occultations quote end quote tour, ongoing, that have been given to me or that I've picked up, Carlos Soto-Roman's Haiku' Minero (La Calabaza del Diablo, 2007) comes to mind as one of the greatest would-be finds. Would be, save for instead of finding the book, it was given to me by Carlos when we read together for the New Philadelphia Poets' Reading Series. Haiku' Minero is a beautifully bound text-image collage, artist book quality, oscillating between the lyric (baroque even, by post-LANGUAGE standards) and the multiply-narrated, outrage over language's failure to either articulate or intervene in real-time catastrophe. A series of poems, wash images, and epigraphy verging on palimpsest, is dealing principally as investigatory of mine labor & the mine disaster, ensuing strike, & strikes throughout Latin America since 2006, and, at times, prior. Roman is curator of the American part of the international rhizomatic journal Elective Affinities. This book, after first read thru, is so elegant, so visceral and important. More on it as I delve further, my Spanish so-so. But the book (and also the events it circles around) also reminded me to post about the No Borders project, which I hope all of you will check out further. As part of their project, No Borders: Communities Living & Working with ASARCO, colleagues/friends Lin Nelson and Anne Fischel in May went to Cananea, Mexico—the site of an almost three-year long miners’ strike over occupational/environmental health conditions. The mine’s owner is Grupo Mexico, which now holds ASARCO as a subsidiary. Anne and Lin have had three articles published about the project: The first, “Bankruptcy as Corporate Makeover” in Dollars & Sense, was written with Lin’s daughter, Mara Kardas-Nelson, and provides an overview of the No Borders project. “The Assault on Labor in Cananea, Mexico,” also in D & S, profiles the Cananea strike, which was ended on June 6 when Mexican state police using tear gas forcibly took over the mine. A shorter piece on the Cananea situation, “Struggling for Health, Labor and Justice: Los Mineros of Cananea, Mexico” appears in New Solutions: A Journal of Occupational and Environmental Health. Anne and Lin traveled to Washington, D.C. in late June to interview Lois Gibbs, Director of the Center for Health, Environment and Justice. And Anne went to El Paso in July to film a tour of the now permanently closed ASARCO smelter by ex-ASARCO employees who have been in the forefront of exposing ASARCO's record of hazardous waste contamination of El Paso. The publisher of my book Occultations, Marthe Reed's Gaze, and Mark Lamoureux's Spectre (and soon forthcoming several other titles, including Carrie Hunter's The Incomposible) has a new blog. HERE. Right now it's a shell of a blog that will become fuller as the days go on. You can help out with that: Black Radish is looking for your active collaboration here, thus the invention of the blog. That, plus a desire to have an extra-website presence beyond the impossibly ugly, unreliable, Facebook. With the US engaged in imperial wars around the globe and amidst the collapse of the most recent mode of global capitalism, we at the Radical Philosophy Association have found reflection on violence both timely and imperative. The theme for our upcoming Ninth Biennial Conference will, therefore, be “Violence: Systemic, Symbolic, and Foundational”. Unmistakably, violence shapes our social world. Oppressive systems are founded in and maintained through violent action. Capitalism demands and enforces conditions of starvation, brutalization, and alienated experience. Patriarchy thrives on the threat and reality of physical and sexual assault and pervasive psychological debasement. Racist and colonial structures demand occupation, enslavement, and incarceration. We want to both riff of this rather full thesis and complicate it, composing as well as performing extant work that discusses a notion of violence as emerging from, a la Benjamin, lack or closing off of opportunities, access. Yet complicating that now widespread causal position. In parallel with this conference we're working on Kenneth Gaburo's Maledetto, Lingua II. The very piece my students last year performed for our poets theater week, and performed beautifully--so, bar is high. I actually liked my students' work on the piece better than I do the very good (but a bit slow) version on UBU WEB. It provides interesting contrast to the rehearsal tape excerpt I have here. This piece for seven virtuoso speakers is challenging, and I'm loving it. The large score (which serves as prop during live performance) is something to decode, is deeply unconventional--a work of art in itself. Rehearsals are becoming reprieves with this monstrous piece. Of particular difficulty is the varying tempi needed to be kept in mind while syncopating the voices. The work itself is what we might call performed violence, and though Gaburo's work in cognitive research and linguistic expressionism (not to mention seriality and minimalism) might appear to be "purely formal" and (as I'd thought when I worked on this piece for the first time around) disembodied, Maladetto is rather deeply political and subtly embodied--embodied in the sense one might think of Beckett's Not I as embodied--the shorn body present in its absence or furious neglect. 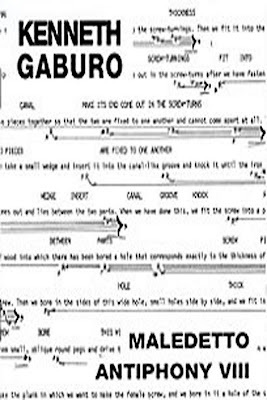 Gaburo himself was a composer who worked mainly out of the University of Illinois, though he also did crucial work with Lingua (also founding Lingua Press around this time) while at UC San Diego. A self-described feminist, Gaburo was an anti-war activist, an ecologist, as well as an instrumental member of faculty unionism in the 1970s and 80s. I read Maledetto as principally a feminist piece, a work in which six voices perform their own failure to undermine a main speaker, a foil of a pedant expert in "screws" and "screwing," (this is my voice) the various glottal voicings of the other six under constant siege, in fact, oscillating between protest, complicity, and internalized resignation to their positions as bodies to be raped, voices to be made sublingual, or at least sub-cognitive, in effect sub-human. 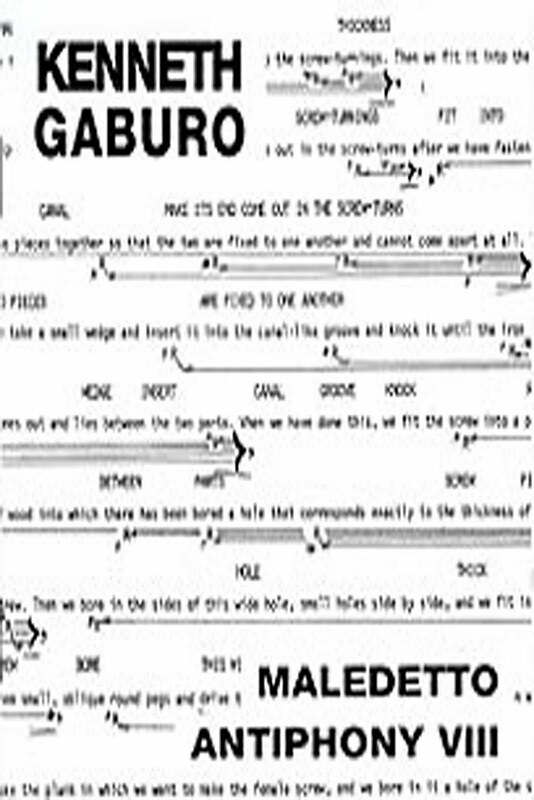 A very different piece of Gaburo's, RE-RUN, was composed after 20 hours of self-imposed sleep deprivation. Gaburo, not unlike myself for various pieces, explores both extremes and subtleties of bodily subjugation or vulnerability, corporeal practices' relation to compositional process and output. I'm now beginning to work on a piece for live voice and taped voice (2 channels) that hopes to read RE-RUN, or translate it, as text--to do a poetic reverse engineering on it. Never mind that my audio is not cooperating at moment. The lovely thing is that unlike many of my venues, this one I have pictures of (sent graciously by the curators of the conference). This way scouting can be done, and the piece can utilize the aspects of the (very large) room. How we translate the tailored work for the ensuing tour becomes another problem--a good one to work on as (yikes) I prepare for teaching this week. Mark Lamoureux’s SPECTRE is Now Available @ SPD!